I just visited a local school and we started some seeds.When it came time to find a location for the seeds, it was a bit of a challenge. They had a closet with one small bulb which obviously would not work and they also had a window area which was ok, although a bit cold. 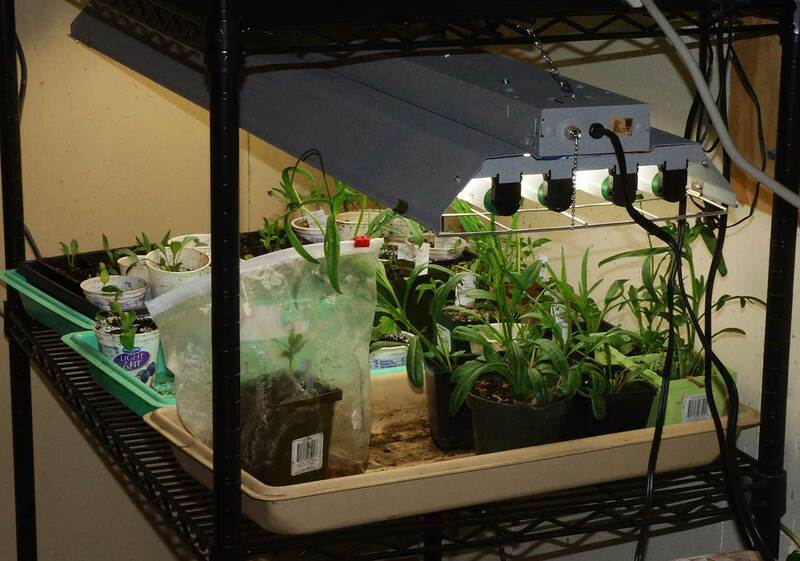 Ideally, they could buy a shop light and use that for both seed germination and light for the plants. Initially, I put the shop light right on top of the plastic tray top and it helps to generate heat for better germination. Here are a few ideas from other sources on how to take a basic shop light and make it usable as a grow light for plants. Below is the system I use with just wire shelving and 4 bulb fluorescent lights. Using wood, you could create a way to hang the light fixture. Below is a setup using plastic – the article is at this website. Here’s a comparison of a LED shop light versus a T8 fluorescent shop light. For me the big consideration is the amount of light or Lumens that is going to be available for the plants. The four bulb fluorescent fixture is a big winner at 11,000 Lumens over the paltry 3200 for the LED bulb. Another thing I notice is that the LED has a much different color spectrum than the fluorescent – 4000 versus a range of 5,000 to 6500. I know that plants do well with fluorescent bulbs, but have never tried the LED. I also like the fact that I can just use one fluorescent fixture to get the 11,000 lumens, but I’d have to use four fixtures to get up to 12,800 lumens with LED. The cost would also just to $160 for the four LED fixtures. I just bought a couple of new shop lights and wondered what kind of bulbs would be best and also cost efficient. New fixtures use the new T8 bulb. It uses less electricity and puts out as much or more than the old T12 bulbs. Note – there are now T5 bulbs which come in different wattages. Bulbs also come in a number of colors from Day Light (5000K), Warm Light and Cool Light (6500K). Most of my research indicates that the Cool White bulbs are as good as the special Grow lights which are much more expensive. They do lack some of the red spectrum, so some sites recommend using a mixture of incandescent and cool white. That seems a bit complicated and more expensive. In my experience over the years, plants do well under just about any types of fluorescent lights. Here are the sites which talk about lights. I’ve decided to do a mixture of Cool White and Warm Light/Daylight bulbs. This light fixture is available from Home Depot or Amazon. It does seem to be built better than the typical shop light and can also be plugged into each other. They also have a pull on/off switch. Click here for a comparison of LED versus Fluorescent Lights.